Sixteen information systems students from Quinlan worked on real-world projects with Aalto University School of Business students in Finland. In August 2018, 16 sophomores and juniors studying information systems at Quinlan traveled to Helsinki, Finland, for a class at Aalto University School of Business, a top business school in Finland. The class was jointly organized by Quinlan professor Nenad Jukić and Aalto University professor Laura Sivula. 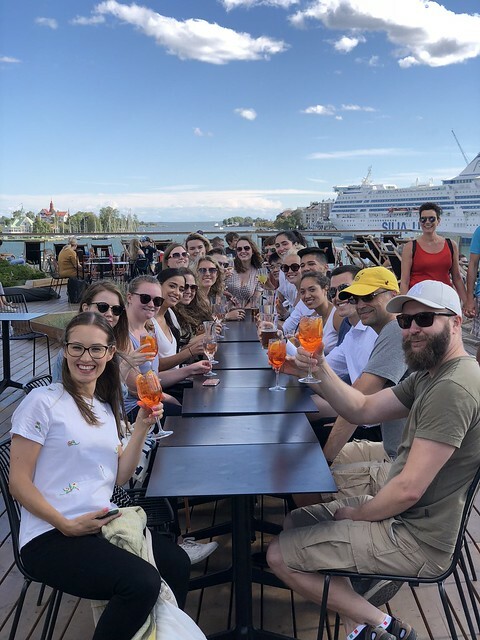 During the class, Quinlan students and Aalto students worked on data and technology projects for Finnish corporate and government organizations, visited Helsinki-based tech companies, and enjoyed cultural experiences, including a trip to Tallinn, Estonia. "Our students represented Loyola in the best possible fashion, and they received very positive feedback both from Aalto students and faculty and the local partner organizations," said Professor Jukić. This was the ISSCM Department's first-ever study abroad course for undergraduates. Due to its success, the class is scheduled again for summer 2019. View photos from the study abroad class in the gallery below or on Quinlan’s Flickr page.